Residential Customers are billed every month at the rate of $8.50 per one thousand gallons used and is calculated based on the usage provided by the water company. Customers that have well systems are billed at the rate of $51.00 monthly. Residential customers in single family homes and multi-unit apartments (3 or less) are billed $16.40 per month per home for trash collection and disposal. The billing for trash is processed on your Gary Sanitary monthly bill and for all billing questions contact customer service on 219-883-1027. Service request concerns for large item pick up, contact Republic Service on 219-662-8600, or www.republicservices.com. Paying your bill by mail will keep the District’s operating costs to a minimum. To remit the payment by mail, detach the bottom portion of the bill and send the payment in the pre-addressed envelope provided. Please allow seven days for mailing. You may also pay in person at the Customer Service Center or place your payment and the bottom portion of your bill in the night drop-box. Payments put in the night drop-box will be applied to your account after 12:00 noon the next business day. All payments are due upon receipt. A ten percent penalty is added to the current charges on the thirty-first day from the billing date. Failure to receive your bill does not excuse the penalty charge. An industrial user is a non-residential user who discharges wastewater into the Sanitary Districts collection system. For sewer related problems, please contact our Sewer Collections Department on 219-944-1211. They can be reached 24 hours a day, 7 days a week. As Special Administrator to the Gary Sanitary District, Mayor Karen Freeman-Wilson wanted to be certain that all citizens were aware and understand the fees associated with the Storm Water Management District. 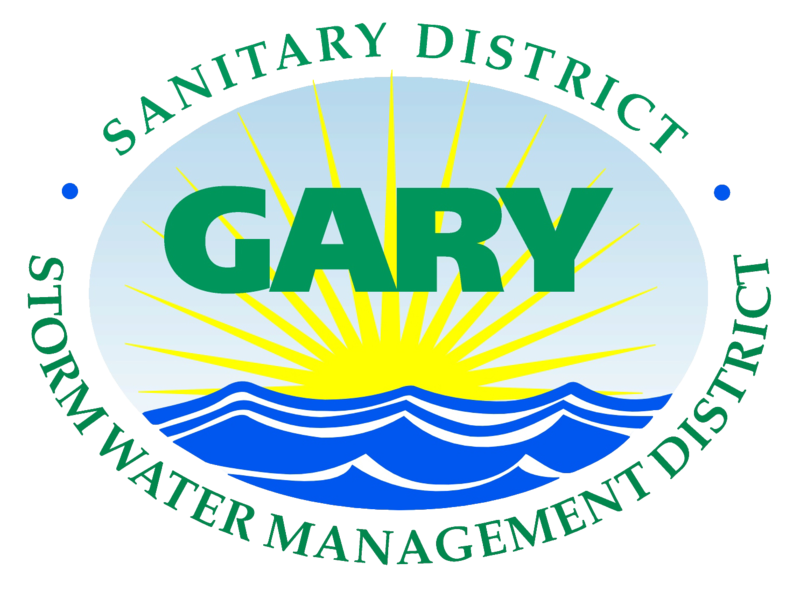 The Gary Storm Water Management District for the City of Gary, Indiana is charged with the responsibility of providing for the collection, disposal, and drainage of storm and service water and the relieving of sanitary sewers of such in the Storm Water Management District. Polluted stormwater runoff is discharged, often untreated, through the stormwater sewer system directly into local water bodies. According to the U.S. EPA, polluted stormwater runoff is a leading cause of impairment to the nearly 40 percent of surveyed U.S. water bodies which do not meet water quality standards. When left uncontrolled, this water pollution can result in the destruction of fish, wildlife, and aquatic life habitats. This polluted stormwater runoff also serves as a threat to public health due to contaminated food, drinking water supply, and recreational waterways. Polluted stormwater runoff is discharged, often untreated, through the stormwater sewer system directly into local water bodies. According to the U.S. EPA, polluted stormwater runoff is a leading cause of impairment to the nearly 40 percent of surveyed U.S. water bodies which do not meet water quality standards. When left uncontrolled, this water pollution can result in the destruction of fish, wildlife, and aquatic life habitats. This polluted stormwater runoff also serves as a threat to public health due to contaminated food, drinking water supply, and recreational waterways. The Federal Government has required all storm water districts to comply with the Federal Clean Water Act. To comply with this unfunded mandate, the Gary Storm Water District Board of Directors passed Resolution Number SW11-06 (July 2011) to establish the creation of a storm water district user fee. This resolution was Passed and Adopted by the City of Gary Common Council by final reading on August 2, 2011 (please refer to City of Gary Ordinance CP02011-41/Ordinance 8472). Each parcel is assessed, either a flat monthly user fee or monthly user fee by acreage, based on the property class code that the property falls within (i.e., residential, commercial, vacant land, churches, charitable organizations, railroad and pipeline, cemetery, industrial, agricultural, etc.) (See User Fee Structure -Other side of this document). All stormwater user fee bills shall be rendered on the Lake County Treasurer’s Property Tax Bill and distributed as such. The stormwater user fee shall be due on the same payment date as the Lake County Treasurer’s Tax Bill. It shall be a violation to fail to pay a stormwater user fee when due. All bills for stormwater user fees not paid on or before the due date shall be subject to a collection or deferred payment charge as rendered by the Lake County Treasurer and shall be reflected in the Lake County Treasurer’s Tax Bill. Pay the stormwater bill when due. Late fees and penalties caused by nonpayment are subject to various state, county, local laws, and/or ordinances and are non-negotiable unless there was an assessment error. For information on appropriate property codes and combining contiguous properties as an option to reduce financial impacts, contact the Calumet Township Assessor’s Office at (219) 885-0555. 100 - 199 Agricultural 20 acres or less = $2.50 per month. Greater than 20 acres = $0.125 per acre per month. 300 Industrial Vacant Land 20 acres or less = $2.50 per month. 400 Commercial Vacant Land 20 acres or less = $2.50 per month. 690 Cemetery 6.66 acres or less = $2.50 per month. Greater than 6.66 acres = $0.375 per acre per month. 805 Utility Vacant Land .25 acres or less = $0.50 per month. .251 acres to 20 acres = $2.50 per month. 830- 841 Railroad and Pipeline 20 acres or less = $2.50 per month.